After 4 days rest and almost eating my body weight back down at Lukla, it was a pleasant relief to get back up to EBC early this morning! Air feels thinner and crisper for sure, but sun is shining, forecast is decent for the next few days, rib is cooperating thus far and I am itching to get at the icefall after these last few days sitting around (albeit necessary for recovery). This return is a stark contrast from my uncertain and unhappy departure a few days ago. Once again, possibilities exist – at least now, I have a chance – whereas 4 days ago I really wasn’t sure. Forward progress – that’s a result. 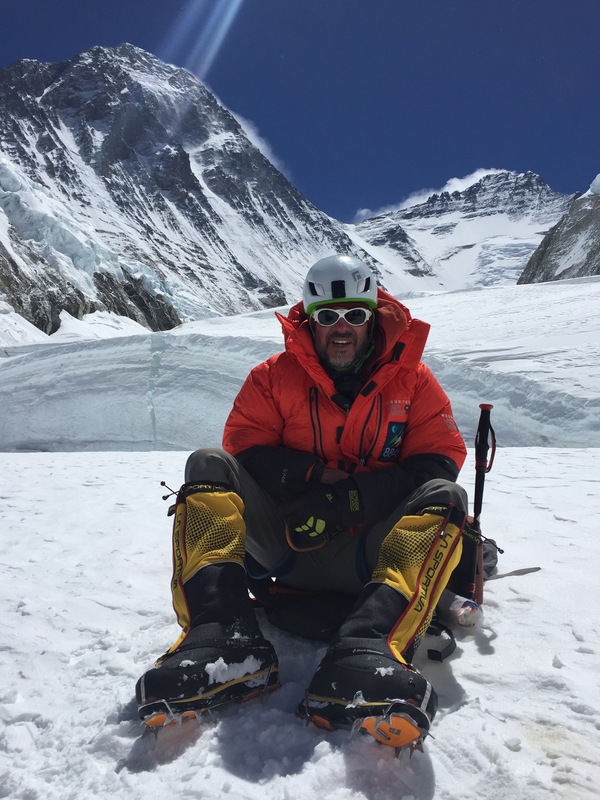 I have heard reasonable reports of the climbing conditions from folks just back from C3 and every reason to hope for a good run back up to C2, passing my guide Jon, old Sherpa Sonam and team-mates on their way down as I move up – it will be very good to see them and hear how they got on. 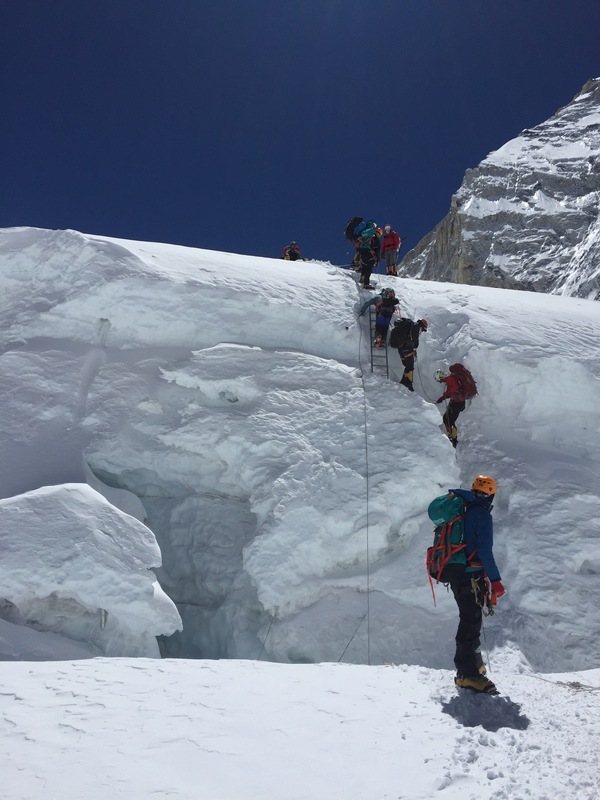 This is the last rotation before the summit push – and is essential to get up the Lhotse face, remove that mystery and spend a night above 23k feet. Won’t be fun but will be very useful. It’s always good – for me personally, at least, to peel back the layers of the unknown – making it that bit easier on the summit push – forewarned is fore-armed, and all that! We leave 2:30am tomorrow (Monday). 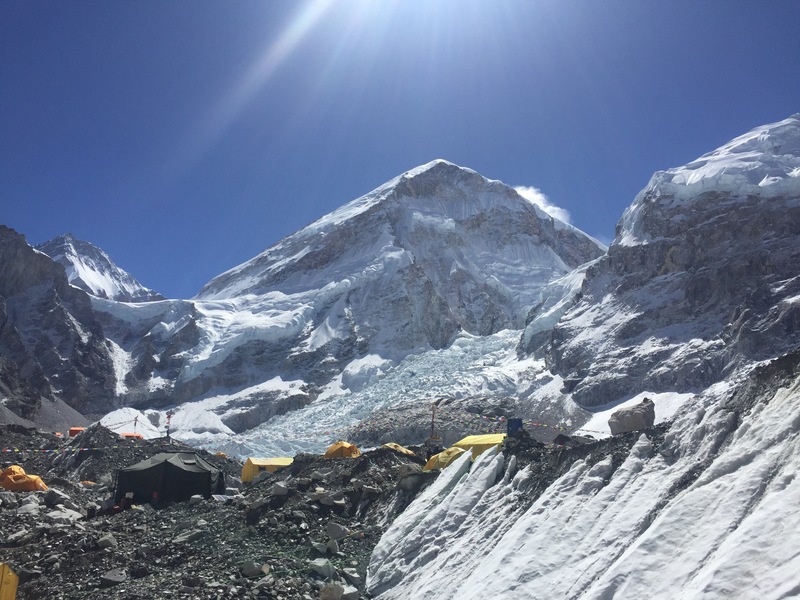 Meanwhile, sadly – the second death on Everest this season – Min Bahadur Sherchan, 85, trying to reclaim his record as the oldest person to summit – heart attack at basecamp. Made it to Lukla earlier today and headed straight to the hospital where an X-ray confirmed I have fractured my L7 rib from coughing these last few weeks. The doctor has prescribed painkillers, plenty of rest, food, liquids and lots of the thick, oxygenated air available down here. He said that technically there’s nothing to prevent me going back up the mountain from a mechanical perspective – it will all be down to if I can manage the pain if I attempt to climb with the broken rib. Per Greg and the revised IMG schedule, I plan to rest here for the next 3 days along with several other folks with varying ailments, and hope to return to EBC Sunday and join with other climbers starting their third rotation to C3 next week. It’s time to settle into my new home and enjoy the rest – even if forced. This fight is not over yet!! Last night, after a hearty dinner that I actually had an appetite for, I slept like a baby with very little coughing and my ribs not too bad for once. Far from cured but far better than I have felt in days. I woke up this morning, showered, had my first solid toilet trip in days (TMI most likely, but you are getting the full-on expedition report!! ), had breakfast and am generally dedicating today to sitting on my behind and resting. I cannot say for sure but I would certainly like to think that three more days of this should go a long way towards helping me back up the mountain. All going to plan, we will return to EBC Sunday and should start the third rotation to C3 on Monday. As the doctor stated – it is all down to containing the pain of the rib – and only one way to find out if this is possible – is to try for C3. That rotation will very clearly inform me if there is still a chance for the summit. I want to also take this opportunity to say a huge “thank you” to everyone for the massive outpouring of concern and support – all your notes and messages, both here and throughout social media – were just the encouragement I needed – and don’t ever underestimate the value to me! The time came – I needed support, and you answered! If I don’t make it up this mountain, it won’t be for lack of well wishers! So thank you again. Keep your fingers crossed for continued progress. And I’ll let you know how I get on. My next update should be upon my return to EBC at end of the week. 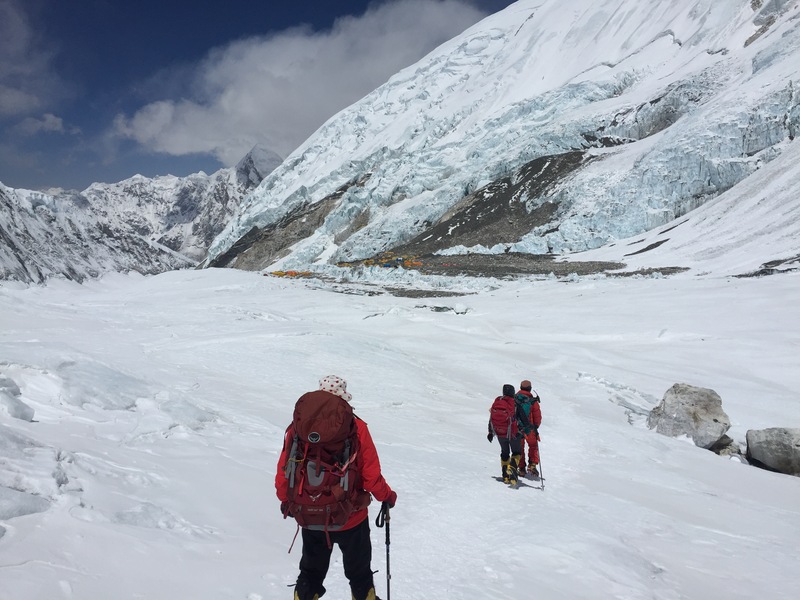 So it’s 10AM Wednesday and I’ve just had a meeting with the senior IMG folks – western guides and Sherpas regarding the best course of action for me. This is where and why I choose to go with IMG… they know the mountain best and they have a wealth of situation management experience that puts them in a position to make the best call for me, even when I cannot. The icepack on my ribs all day yesterday certainly helped but I could still feel significant pain and something pop slightly in my ribs every time I coughed. Add to that my overnight sleep, which was good – but during which the ribs seized up a little bit and once again the pain and lack of mobility were back with a vengeance this AM. I desperately wanted to make the next rotation tomorrow AM – no matter how painful it would be to carry my backpack (not even sure how I would manage it without screaming) or how risky it would be without full mobility or use of my left arm. 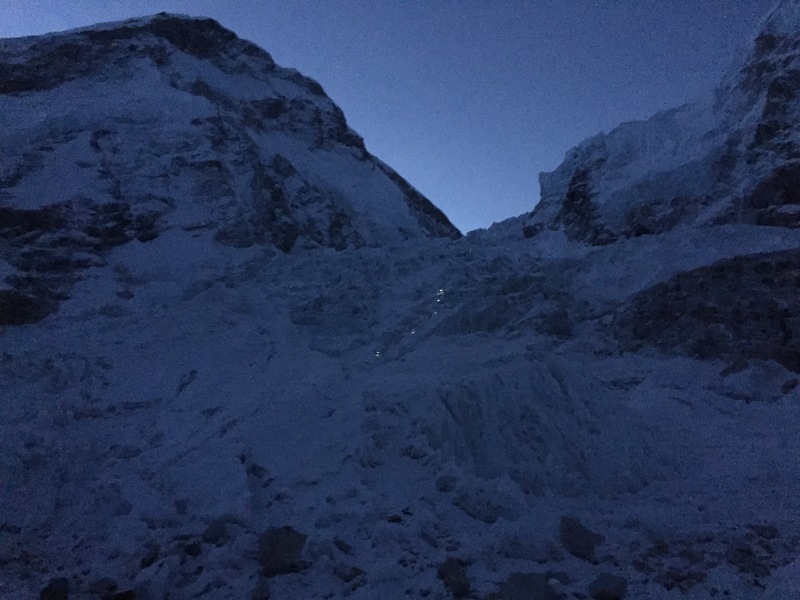 The logic of this desperate climber being to somehow make it to C1 tomorrow and on to C2, C3 (no idea how – but would worry about that then) over the following days, then somehow make it back to EBC and take stock of any damage done at that point. This is where the wisdom of Greg, Jangbu, Jon, etc. comes in to play – they are of one mind on this – and that is: if I was to go back up tomorrow, I would likely end my trip – or at the very least, would not have exercised the best option available to me. With my myopic view seeing no further than the next rotation tomorrow, I failed to count the fact that we still have another whole month to climb this mountain. With that in mind, I am advised to helicopter back down to Lukla (8k+ feet below with much thicker air – better to heal), get an X-ray of my ribs and give my body a chance to heal. The assumption being that once I am on the mend, to helicopter back up, and either rejoin Jon’s team or if that not possible due to scheduling, join another guide, Luke – who I have also climbed with before. I’d be lying if I said I wasn’t sorely disappointed – but am just disappointed that my body has let me down, not at all at the expert advice of the IMG crew – which I am only too happy to follow. In my heart of hearts I know it is the right decision. I can only hope that given the opportunity, my body can heal sufficiently – and in time – to get back up here and summit this mountain. Perhaps false bravado – but after what I have seen so far, I truly believe that with my health I can make the summit. So – my apologies to anyone following if this blog goes a little quiet or dull for a few days – I will most certainly let folks know the outcome of my X-ray, etc. but I hope to quickly move from Himalayan ER back to our regular programming – i.e. Climbing this damn mountain!! 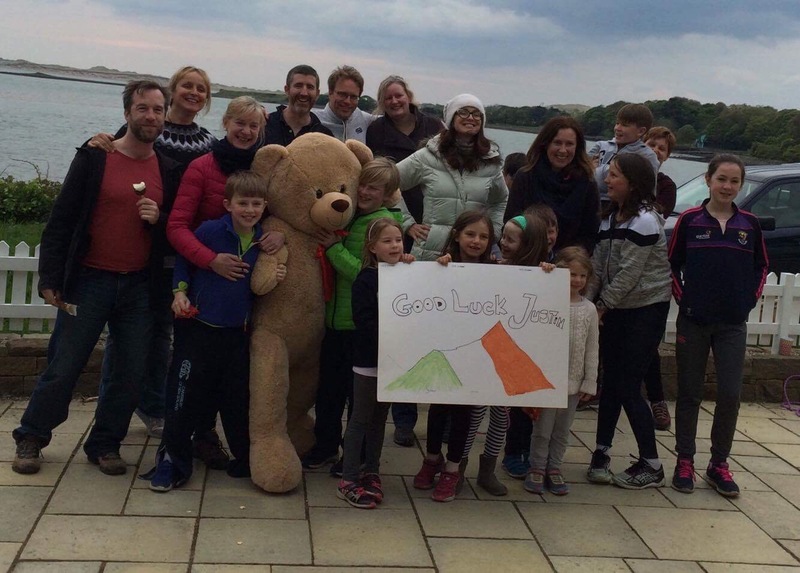 Thanks for you patience and continued support – I don’t plan on letting you down – and I hope to still make you all proud and yet make the summit. Today is May 1st, start of a new month – and g﻿iven we had another rest day today and the fact that on our next rotation we will be bringing oxygen masks up the hill in addition to our regular kit – Jon gave us a demo of how to use the masks and oxygen tanks – which are a critical part of our equipment above C﻿3. As a reminder – on our next rotation we will climb to C3 & stay the night – all without oxygen. I am told this overnight at 23k+ feet will be quite uncomfortable. 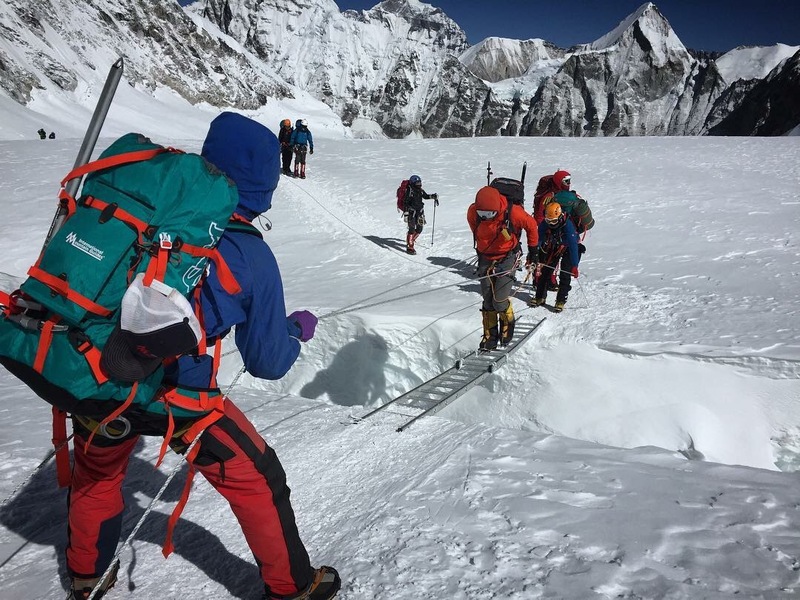 After that – on our summit push – we will climb from C3 to C4 (high camp on the South Col) with oxygen, sleep at C4 with oxygen – and finally, make our way to the summit using oxygen. For those of you that scuba dive, concept is somewhat similar – actually easier, if anything. We all received our masks and took turns hooking up to the ranks and using – trying our best not to do a lame Darth Vader (Starwars) or Bane (Batman) impression! 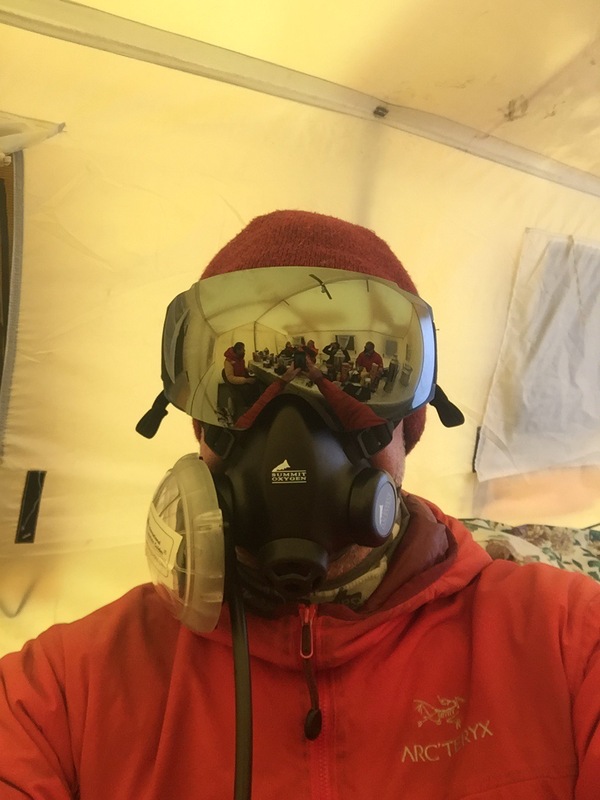 Jon also instructed me to keep the mask on for a while to get extra oxygen – a great healer at this altitude – and sure enough, my ribs hurt just that bit less after – if only temporarily. To pre-empt the question: All of our team are using oxygen. Some folks from other teams have opted to try without – and that is their decision. Statistically speaking, only a tiny fraction of people who have summited Everest have done so without using supplemental oxygen. The likelihood of success is so much less while the risk of injury or death is so much greater that there simply was no question for me. To anticipate other questions: the oxygen tank itself weighs about 18lbs and I will carry one in my packpack at all times, switching out for a fresh tank later in the ascent on summit day, which will then ﻿stay with me until my return to C4. During that time, I expect to use an oxygen flow of 2-3L/min. Since climbing to C2 I had been experiencing a pain in my left lung/ribs when coughing (I’ve been coughing since we made the summit of Lobuche, probably over 2 weeks now). By Sunday AM my overall health seemed to have gotten worse – with a combination of shortness of breath the night before, an increasingly nauseous and gassy stomach and when I got up Sunday AM to tell our guide Jon, something finally tweaked in my left rib region and all of a sudden I could barely cough or clear my throat without experiencing searing pain. Not a good start to the day! 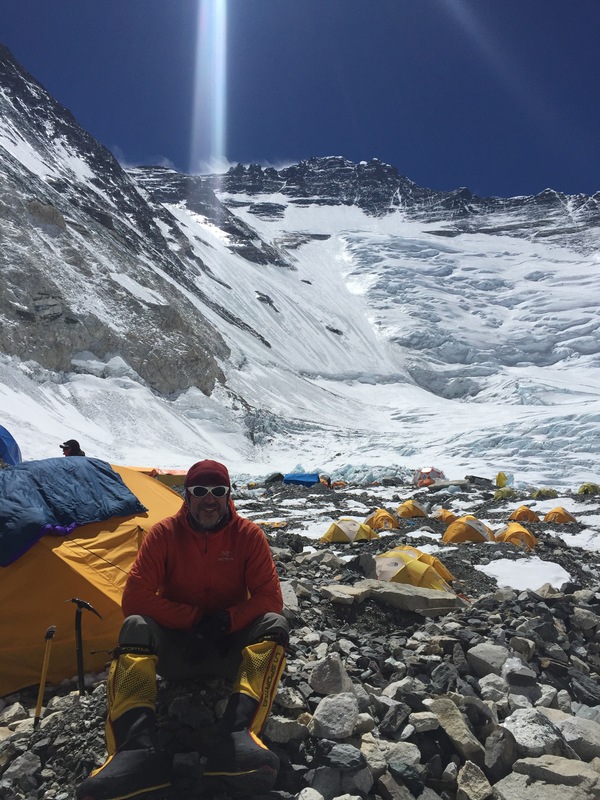 Jon patiently listened to my varied symptoms and observed my movement and we decided it best to pay another visit back up to the doctors of the Himalayan Rescue Association (HRA) at the Everest ER. Upon arrival, there already was quite a crowd milling around the HRA, but none appeared to be waiting to be seen by the doctors – rather, they were all concentrating on radio chatter from higher up the mountain where it seems there had been an accident and they were waiting for an update. What we didn’t realize at the time but found out a little later – was that world-renowned Swiss climber Ueli Steck had fallen and died while climbing alone on Nuptse (peak above and to the right of C﻿1) – where he was climbing as part of his acclimatization for a particularly aggressive and typically ambitious traverse he had planned of first Everest and then Lhotse. For those not aware, Ueli Steck was a master mountaineer. What the rest of us amateurs do in the hills cannot even be mentioned in the same sentence – simply no comparison. 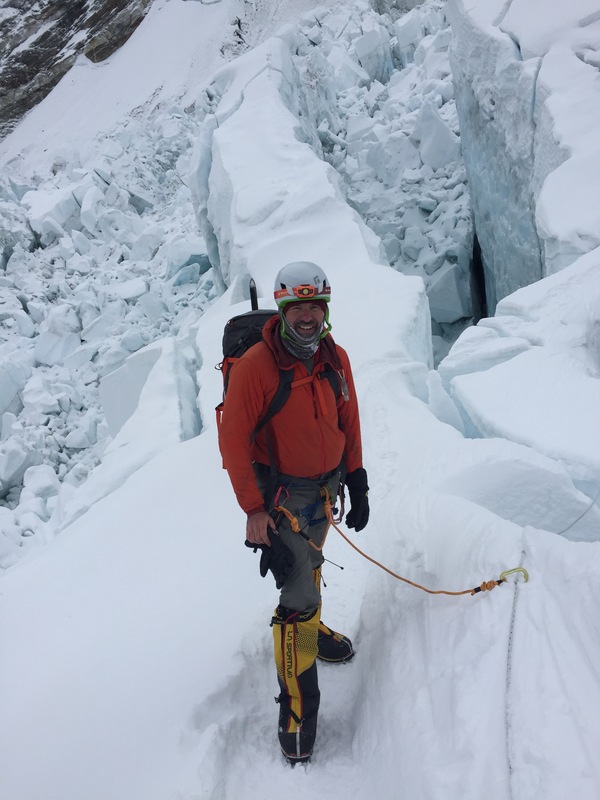 We actually passed him twice this past week on our rotations – him going up the icefall both times as we came down. I only know what I read about him and what one can infer (if anything) from two “hellos” in passing – but he undoubtedly was a man at the pinnacle of his craft and needless to say news of his passing came as a great shock to everyone and really is all a bit surreal right now. It also offered a stark reminder that no matter who you are or what your skill level, there is always so much beyond your control in the mountains. For probably the best article I have seen on his untimely death, click here for NY Times. My health issues not quite so serious when viewed through this lens – but of course at altitude, everyone’s problems are big to themselves. General diagnosis was that I had a bacterial gut infection and while no sign of infection in the lungs, a distinct possibility that I had either pulled or torn a muscle around the ribs and/or fractured or otherwise damaged a rib from coughing so much over the last two weeks. The HRA doctor administered relevant drugs and I went on my way. 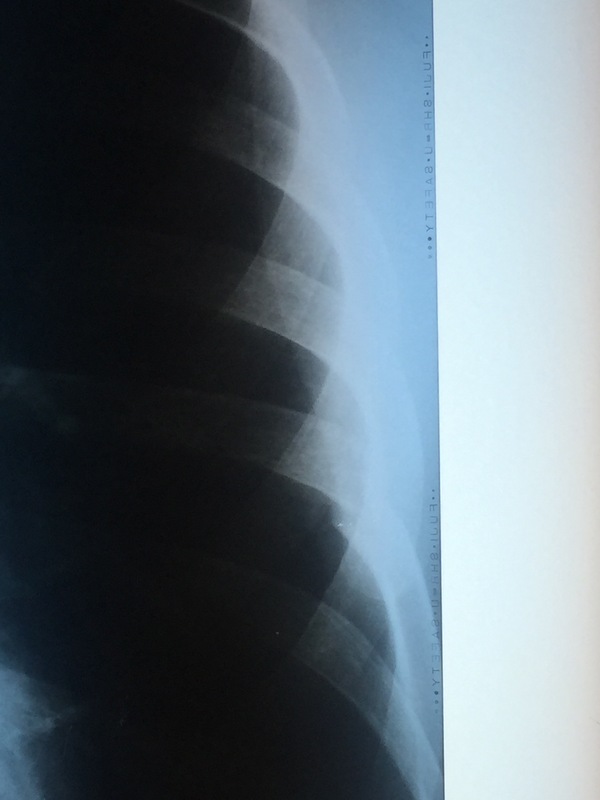 Oddly nice to hear that the rib injury is more mechanical as my mind already going to potentially far worse places and imagining a clot on my lung; As I mentioned in a previous post – reality rarely proves worse than my imagined worst case scenario! I am happy to report the drugs for my stomach seem to have worked and finishing the course of antibiotics tomorrow, the nausea has gone and my appetite is almost back. The ribs are another thing altogether and the painkillers not doing a whole lot (yet). One thing in my favor is the weather report I mentioned in my last entry – in that we are in no rush back up the hill, so I have some time to figure out pain management options that I hope﻿ will let me continue to climb. 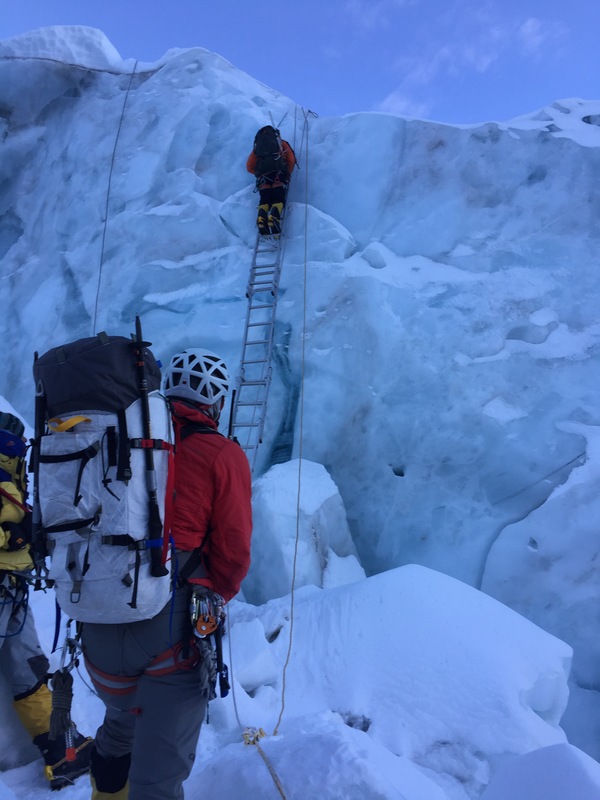 After our false start on Sunday due to issues with ladders in the icefall, last Monday came our chance to finally climb to C1. 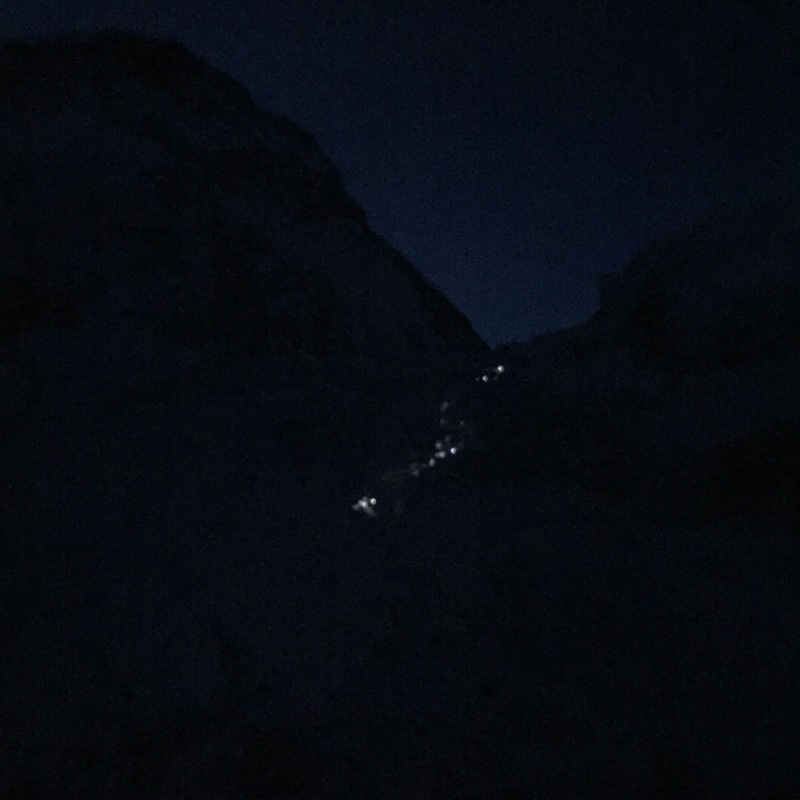 With the usual early start, we trekked to crampon point where yet again, we donned crampons to the backdrop of a string of headlamps making their way up the icefall. The good news was that overall this felt better than our previous dry-run. However, our work was not done yet and there was more of a climb than expected from the football field (where we stopped on the dry run) to get to C1 @ 19,600 ft, especially as the day heated up and we became somewhat dehydrated. After another push, the IMG camp beckoned, perched at the head of the western cwm. We happily fell into our tents and rested for the afternoon before dinner (our first taste of MREs – military style boil in the bag meals – not too bad at all!) and bed later that eve. Wednesday morning came with wind battering our tent. As always in a tent, this sounded worse than it was, but it still sounded bad enough to make me more than a little reluctant to leave my sleeping bag (inertia is a terrible thing!). We had breakfast and hit the trail up the western Cwm towards C2 – with the cold & wind quickly freezing my hands (after NH two months ago where I got frostnip I am very wary of this) – even with the best planned glove system, some mornings just get you regardless. Finally after much swinging of my arms to get the blood flow going again, and a brief period of screaming with pain as the blood returned to my fingers, I was good to go. 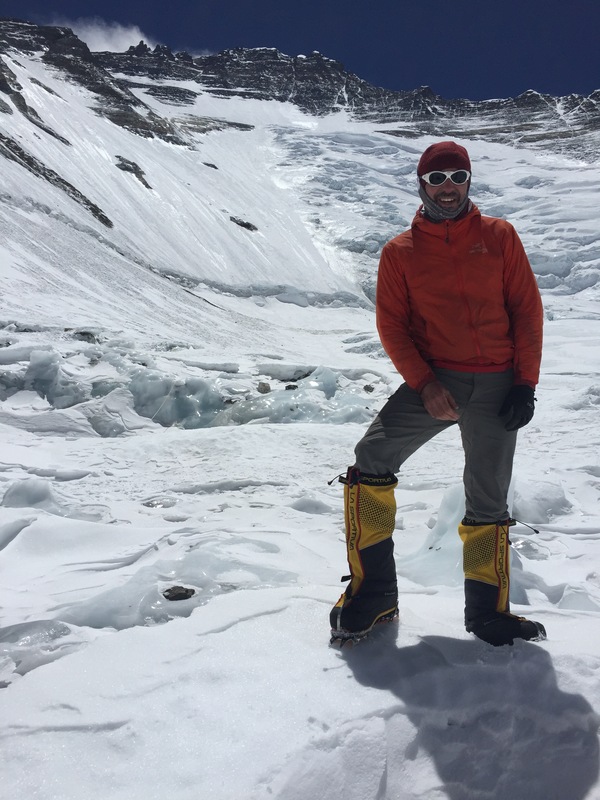 We gradually climbed the same terrain as the day before, and then beyond, crossing some of our largest crevasses to date – some more hairy than others (one in particular where my Sherpa was audibly praying as I crossed!!) Once done with this final rope and ladder work we faced a very long, gradual uphill trek to C2. This is usually a sweltering affair with the Cwm acting as a huge sun reflector – thankfully on this day, the somewhat adverse conditions meant that we didn’t roast as many other climbers have in the past. The thing about the Cwm is that you can see your ultimate goal – C2 – from miles (and hours) away. Distance and perspective are hard things to gauge in this environment. 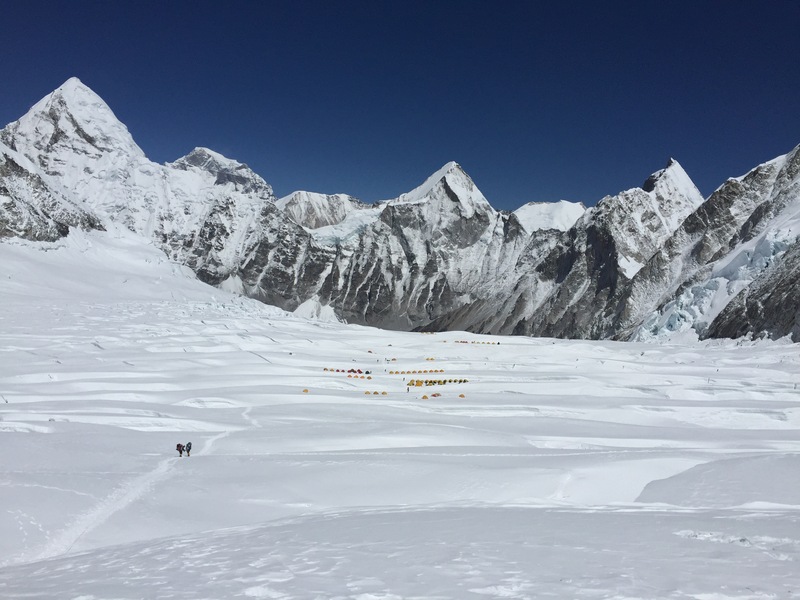 After several hours we finally had C2 nearby and just remained to plod through the various other team camps to make it to IMG, near the back of C2 @ 21,225 ft. We fell into camp – as usual slugging back mugs of tang and Sherpa tea upon arrival. I did notice that my chest cough seemed to have worsened for the travel to C2, in that I now had a mild pain in the area of my left ribs / lung whenever I coughed. My stomach was once again making very odd noises too. Not sure what to make of that yet but all sorts of worries enter ones mind – and one thing is very clear on this mountain from what I have seen of other climbers that have had to descend – it is a war of attrition… your most important – and most difficult – task is to ﻿stay healthy long enough to give yourself a shot at the summit. In and of itself, that is turning out to be no small feat. After a fairly poor sleep I rose Thursday AM and while feeling pretty crappy, joined the team for another relatively short acclimatization trek above C2. 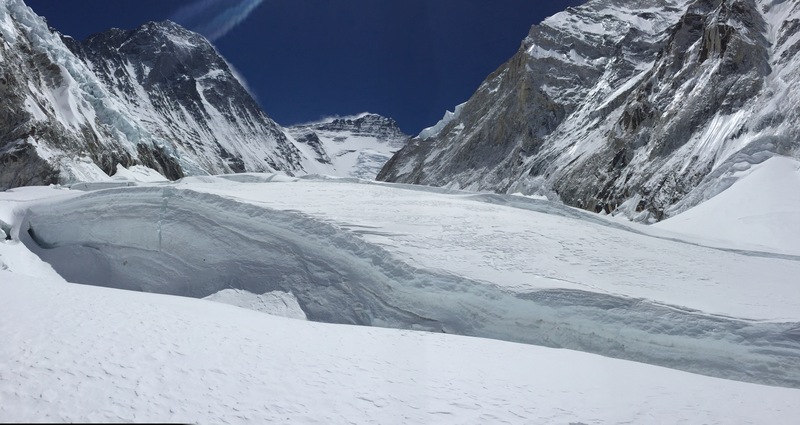 This is where we got our first good look at the Lhotse face, the bergschrund (crevasse formed where the moving glacier in the Cwm separates from stagnant ice above – i.e. from the Lhotse face), C3 perched precariously above @ 23,500 ft, and on to the yellow band, Geneva Spur and C4 on the South Col. 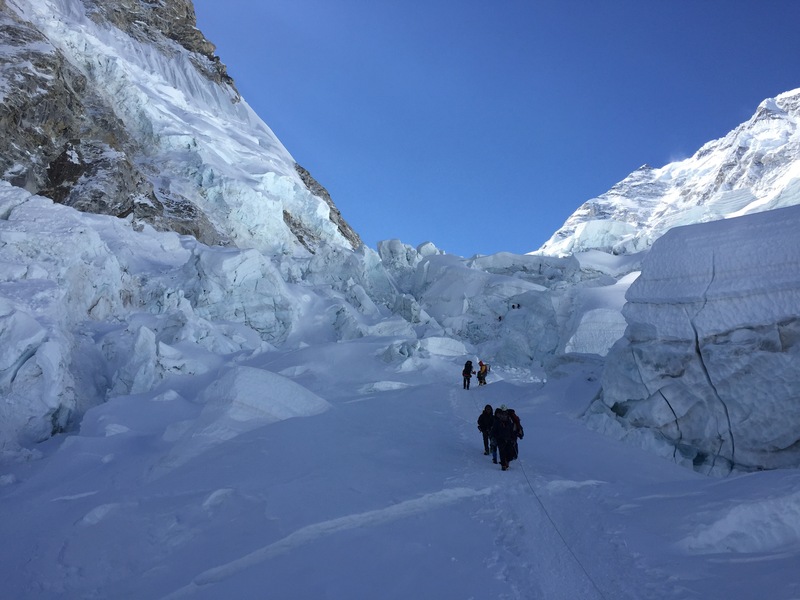 Funny thing (not so much) with Everest – no sooner are you over the challenge of the icefall, crevasses and ladders but you are then confronted with the far more intimidating Lhotse face. For now however, I chose to concentrate on the task at hand for this rotation – and that was to make it to C2, stay awhile and return to EBC – and by that measure, this has been a success. I will worry about the Lhotse face on our next rotation – one thing at a time. Friday morning we awoke and prepared for the trip back to EBC. 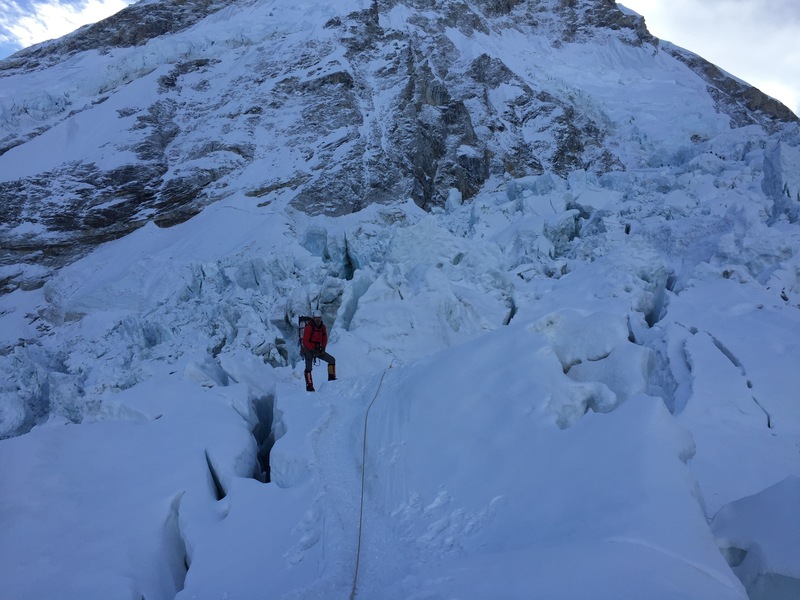 It was once again a cold start but with a quick descent to C1 which warmed us up and then on back down through the icefall before the midday heat. I stopped by the Himalayan Rescue Association (HRA) for a check-up after my few health issues had flared up in C2 above – the doctors found no sign of a chest infection, and suggested I carry on and comeback if things worsened… good enough for now. We got back to EBC camp proper for a great lunch, ﻿dinner, warm shower and contact with the world at large to replenish my spirits. 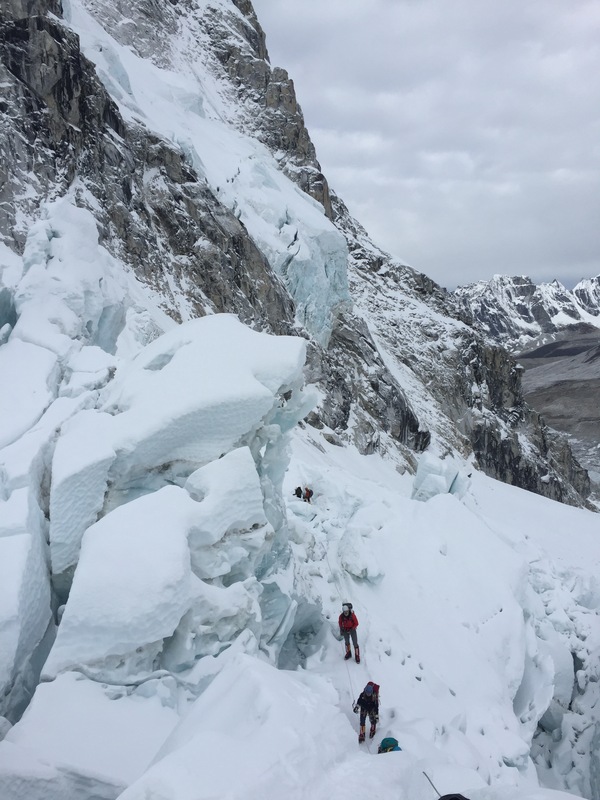 I have to admit that I am still daunted by this challenge, particularly after seeing the Lhotse face and beyond – and maybe not enjoying it as much as I should? In boxing you are never supposed to afford your opponent too much respect – but this isn’t boxing and I don’t think there is such a thing as too much respect for this particular mountain. Only time will prove me right or wrong. Either way, we now have 4+ days at EBC to rest and rehabilitate. I am quite sure cabin fever will have hit by then and we will be well ready to go back up the hill ﻿again. Current weather reports are hindering other teams advances, but given we are not planning a move for some days yet – our timing may be perfect. Next move likely towards the end of next week – but I’ll update before then as things become clearer. Of course – my customary plea on behalf of the American Kidney Fund... Together, we have just broken $24k raised along the way to my total fundraising goal of $25k! So, if anyone reading who has not yet donated – and interested in helping me reach my ﻿goal, please click here. Many thanks for your continued support – honestly, this is what really matters, and your donations will be put to incredibly good use by the AKF. It’s 3:55AM here at EBC and just a quick note to give you an idea of how things work around here and who sets the schedule… i.e. The mountain does! I had set my alarm for 1:55 to give me a few extra minutes to get my stuff together and get over to the dining tent by 2:30. Somehow either my alarm didn’t go off or I slept through it – not a great start! That said, was only by 5 mins so I wasn’t late, just more that my planned routine was broken. 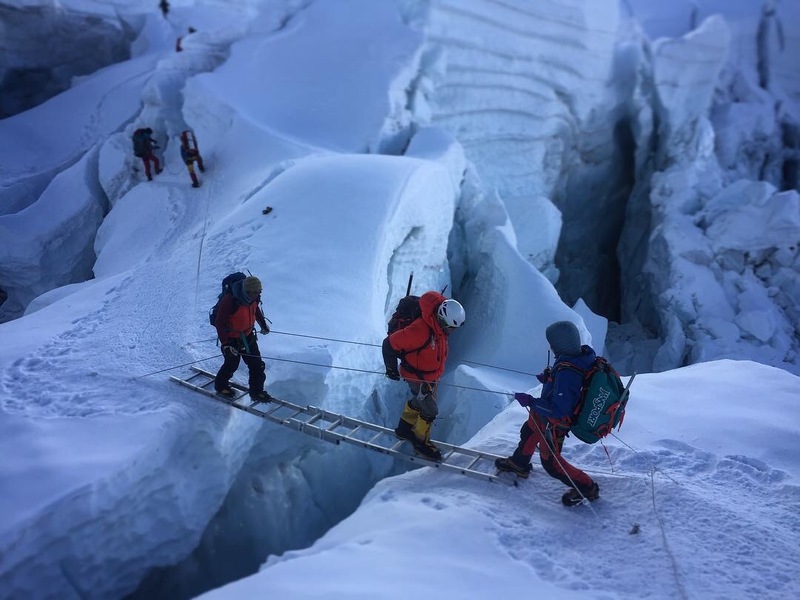 So, ready to do this – I think – when we get word from our guide that part of the icefall near the very top (beyond the football field where we stopped Friday) had collapsed and so requires the icefall doctors to re-rope the route during daylight later today. Nothing to be done except return to bed and with luck we will try again tomorrow. Mountain life. Just one of many examples of even when you show up prepared, there are so many variables in the equation (training, fitness, health, weather, ice conditions, other climbers and just blind luck) – and more beyond your control than not – that just maybe, if everything lines up, may eventually equal a summit. Anyway, we have plenty contingency days in the plan so this is nothing more than a minor inconvenience. For now, I’ll simply relish an opportunity to get some more sleep in my warm sleeping bag. We just got word that the section in question has been re-roped, so we leave for camp 1 @ 3am tomorrow (Monday). All going to plan, we then stay Mon/Tues @ camp 1, Weds/Thurs @ camp 2 and return to EBC Fri.